It’s a warm, sunny afternoon in mid-September. My typing fingers still have the heady scent of the basil flowers I just picked off to encourage the plants to keep growing. I don’t feel the least bit like autumn. “Fantastic fall weather is expected to dominate mid and late September and continue well into October, providing more than the typical number of warm, sunny days…,” the forecasters note. Further, “Extended periods of warm and dry weather are likely, but totals for the season are expected to be near normal due to an increase in active weather late in the season….” We’re talking about fall, so that means late November and early December. OK, so I’m a weather geek. What does this weather talk have to do with gardening? In a word: Yippee! The time we lost in our cold spring is being given back to us this fall. There’s no making up for the cloudy, drizzly, tomato-less summer because the days just aren’t long enough now. But you can knock yourself out planting fall flowers and hardy herbs in the ground or containers over the next couple of weeks, or even longer. Garden centres are packed full with fall treasures and fabulous end-of-season sales. Look for cheery chrysanthemums; tall, slender native asters in blue and purple; and astonishing Japanese anemones, sedums and ornamental grasses. You’ll also find old favourites like purple ornamental kale/cabbage and bright ornamental peppers. This year, finally, all the local garden centres I spoke to assured me they had lots of pansies in stock – something I’ve hoped for, for a long time. 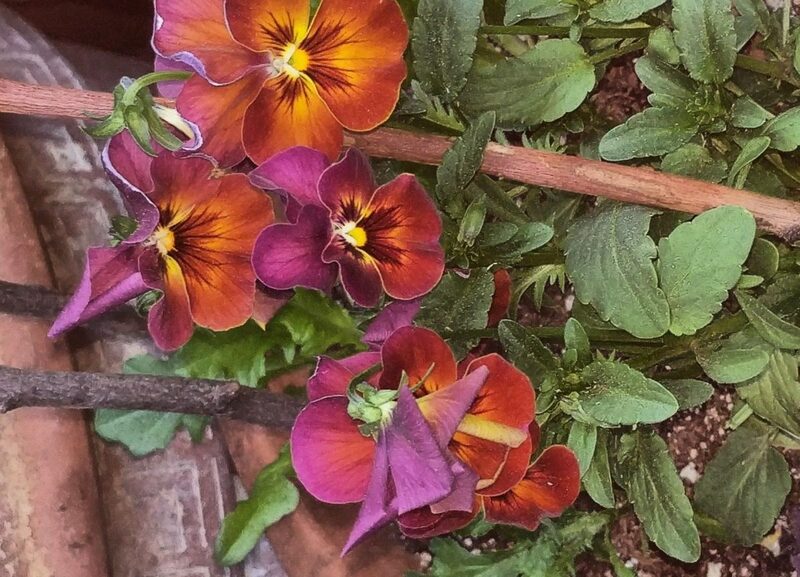 Our spring pansy season is too short, anyway. It gets hot and humid too quickly. So autumn is perfect for enjoying a second round of these charming flowers. Summer perennials are on sale at deep discount prices everywhere. You can plant them now for next year’s garden or just pot them up with other things for an autumn container. They’re so low-cost, you don’t have to worry if they don’t make it through the winter. And don’t forget to look for cold-hardy herbs when you’re plant-shopping. Parsley is particularly hardy, sometimes poking its leaves through the snow. It also makes a puffy green accent in mixed containers. Sage and chives also love the cold, as do some thymes. Put together a container of Thanksgiving herbs now, and you’ll have them fresh for your stuffing in October. You can get everything I’ve mentioned here in the Beach. Judy, at East End Garden Centre on Queen St., told me, “We’re a full-service garden centre, and we’re an all-organic store.” They have pansies and herbs in stock until November, she said, and also carry autumn decorations like straw bales, gourds, cornstalks, pumpkins and wheat, in addition to the traditional fall flowering plants. East of Eliza, on Gerrard just east of Woodbine, offers pansies, too, along with anemones, sedums and fall ornamental grasses. Nicola encouraged gardeners to check out the store’s 75-per-cent-off table for “amazing bargains.” Choice perennials like hydrangeas and perennial geraniums are also marked down. They’re known for their fabulous cut-flowers, but these folks love all growing things. A little off the usual track, but with on-site parking, is Beech Nursery, down at the south end of Carlaw. Michael promised me they have pansies available, together with ornamental kale and colourful ornamental peppers. All perennials are sale-priced. Hostas and ornamental grasses have been flying off the shelves lately, but you may get lucky and find just the one you want. Mary Fran McQuade is a local writer specializing in gardening and lifestyle. Love the article. Just to let you know, Michael, at Beech Nursery is very co-operative with special orders for items that are not on the shelf. I have had great success with everything purchased at the Nursery and as an added bonus, he carries Sea Compost – a marvelous top dressing for everything, which is environmentally friendly and safe for people, pets and wildlife. Glad you liked the article, Margot! Thanks for adding the helpful info about Beech Nursery.